Buying a new home or relocating your office? Here’s how to find a trustworthy and reliable residential and commercial moving company in Calgary. Moving into a new home or office can be a very stressful experience, which is why hiring a reliable moving service is crucial. While researching a moving service company can be very time consuming, remember you are looking for someone who will not only pack and move everything you own, but that you can trust with your most valued belongings. 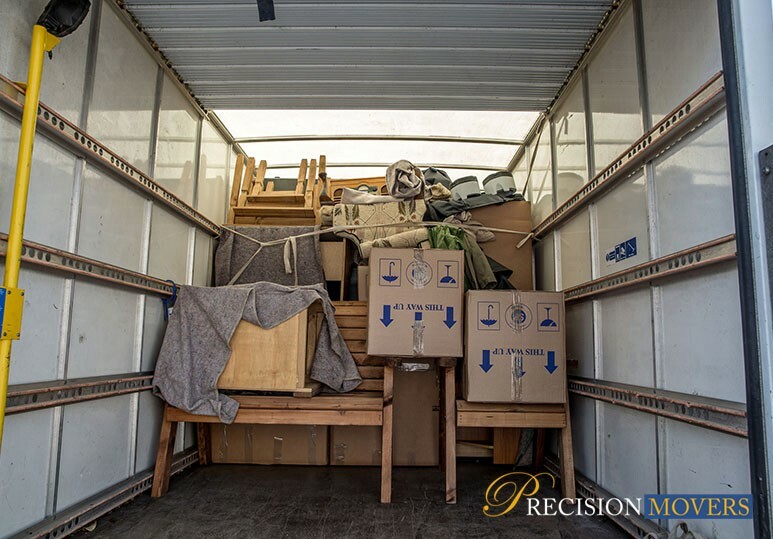 At Precision Movers, Calgary’s leading residential and commercial moving service, we understand that moving is a difficult task and do our very best to make sure your relocation goes as smoothly as possible. The process of relocating can be a complicated affair and proper organization is crucial to the success of your upcoming residential or commercial move. Some disreputable moving service companies will provide a false, low estimate to gain your business, only to demand a higher payment before the delivery is made. In some cases, they can even double or triple the cost of your move and if you want your furniture back, you have to concede and pay the extra cost. Avoid being taken advantage of by…making sure you get a written estimate beforehand and if it sounds too good to be true, it probably is. Beware of a moving service that requires either a large upfront payment or the total amount when they pick up your items. This is important because, once you hand over the money, you no longer have any control over the situation and your belongings. Avoid being taken advantage of by..staying away from companies that require a total amount upfront. In addition, calling them at the first sign of trouble can give you a slight leverage for getting your items back safe and sound. Whether you are looking for a residential or commercial moving service, hiring a company that is not licensed or insured can be disastrous. Avoid being taken advantage of by...ALWAYS asking for documentation of their proper licenses and insurance policies. Before considering a moving service, make sure these are all up to date to ensure your belongings are safe. Like any business, a professional moving service builds its reputation over time. Companies that have earned a bad reputation will often change names to mislead and confuse prospective customers. Avoid being taken advantage of by...Listening for how companies answer the phone or begin their voicemail greeting. Providing a generic ‘moving company’ greeting rather than an official name is a big sign that the company is trying to hide from their past. If you are looking for an accredited residential or commercial moving service, there are some simple steps you can take to prevent falling into any scams. ALWAYS double-check that the moving service has a real address and is not just a scammer representing their website as an actual business. Whenever you can, avoid paying cash for your residential/commercial move. When you pay cash, there is no evidence of a transaction so if your things get lost, you have no evidence of every having paid for the service. One of the most reliable ways of finding a professional moving service is through word-of-mouth from family and friends who have moved before. A reputable moving company should offer additional types of moving insurance to ensure you have the highest protection in case something happens to your valuables during the move. It’s very important to make sure that your moving contract is complete, with all of your goods listed, before signing anything. Before deciding on a moving company, find out how they process claims in the event you need to file one. You want to make sure that, in such a situation, all claims are handled quickly and properly. Everyone should be entitled to a secure and sound relocation at a fair price. By knowing the common scams carried out by some moving services, you can enjoy a hassle-free, economic moving experience. To find out more about our Calgary residential and/or commercial moving services, contact our office today at 403.540.4393.